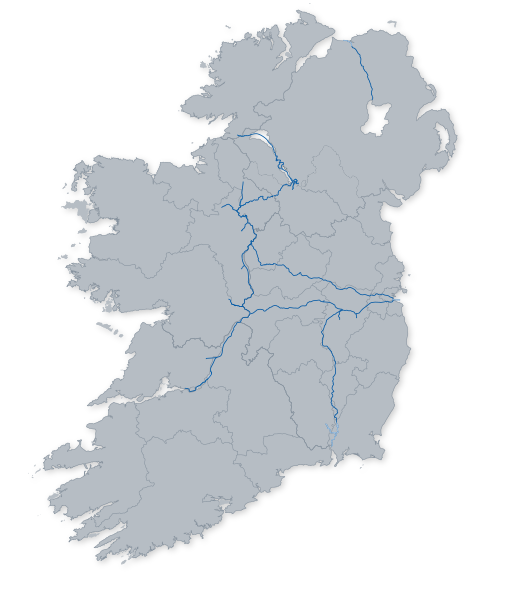 ​Waterways Ireland is extending the Smart Card system to include lock passages on the River Shannon and Lower Bann. The service will be tested from a technical perspective at Albert Lock on the Shannon and the Cutts Lock on the Lower Bann for a two week period beginning on the 16th of April 2018. Following the technical test period and depending on the learnings taken from it, Waterways Ireland will then begin the roll out of Smart Card usage at all locks and lifting bridges on both the Shannon and Lower Bann. Marine Notice 15/2018 has been issued to this effect. The pilot at Albert Lock will run from the 16th – the 30th April 2018 and boats will have the following payment options – use their existing Smart Card, pay in cash or purchase a Smart Card. Many boaters already have Smart Cards as they use them to purchase other services along the Shannon. Hire boat companies already provide the Smart Cards to their customers. Boaters can buy Smart Cards from local retailers or order online– the list of retailers is available from www.shopwaterwaysireland.org. The remaining Shannon locks and bridges will accept payment by smart card and cash from the 1st May until the end of June 2018. From the 1st July – 30th September 2018 boaters presenting with case will be able to buy a smart card from the Lockkeeper. From 1st October payment will be by Smart Card only and the boater will need to have a valid card on board. Where bridge lifting is required at Tarmonbarry and Rooskey, a combined toll payments for the lock and bridge will be taken at the Lock. The cost of the lock passage on the Shannon will remain the same and will take two units from the smart card. The cost of the lock passage on the Lower Bann will be 1 unit. The lock passage on the Shannon-Erne Waterway will remain at 1 unit. The 10 unit card cost €6.35/£5.55 and the 20 unit card €12.70/£11.10. Waterways Ireland has managed over 1000km of waterways since 1999, investing significantly in improving services and facilities along the navigations including mooring, services blocks, creating and extending boating destinations along the Shannon including Killaloe, Garrykennedy, Dromineer, Ballyleague, Carrick-on-Shannon, Boyle, and Lough Key. Further information on the pilot and the smart card system can be found at www.waterwaysireland.org or by emailing info@waterwaysireland.org. 1 What has changed? Waterways Ireland is extending the smart card to include payment for lock passages on the Shannon and Lower Bann. The aim of this change is to improve services for the customer. The smart card will be accepted for payment at Albert Lock and The Cutts from the 16th-30th April 2018 onwards. From the 1st May until 30th June the smart card option will be rolled out to all the locks and bridges on the Shannon and Lower Bann. The acceptance of cash for lock passages will be phased out in two sections: 1st May - 30th June the Lock keeper will accept both smart cards and cash. 1st July -30th Sept the lock-keeper will sell the smart cards to boaters. From 1st October boaters will be required to have a purchased a valid smart card in advance to secure passage, cash will not be accepted. 2 How do smart cards work? The Smart card has a chip and uses similar technology to that of a bank card. The card is inserted into a card reader and the correct number of units are removed from the card, depending on the service purchased. The customer removes the smart card and keeps it safe until next time. The services operated through the are as follows: Showers 2 units, Chemical toilet 2 units, Pump-out 2 units, washing machine 5 units, tumble dryer 5 units, electricity (2kWh) 1 unit, lock passage Shannon-Erne Waterway and Lower Bann 1 unit, lock passage Shannon 2 units. Toilets are free but the card is required for access after dusk. 3 How will we know whether the lock has changed over to smart card or not? The pilot will take place at Albert Lock and The Cutts from the 16th-30th April. From 1st May, boaters should plan to have a valid smart card on board to faciliate lock passages. Communications will be issued before the pilot begins to boating organisations, businesses, on our website, (waterwaysireland.org), on social media and on Marine Notices. Physical signage at locks will inform of changes to upcoming locks so boaters have time and an opportunity to purchase cards. As smart cards have no expiry, boaters can buy the cards at any time. 4 Where can I get a smart card? Smart cards can be purchased from a raneg of retailers laong the navigiations or the Waterways Ireland webshop www.shopwaterwaysireland.org. The list of retailers can also be found on the shop. 5 How do I know how many units are left on my card? The card reader will inform how many units are left. Each service block and Waterways Ireland public office has an smart card reader that reads the cards without taking any units. 6 How much do the smart cards cost? Smart Cards cost €6.35/£5.55 for the 10 unit card and €12.70/£11.10 for the 20 unit card. The lock passages on the Shannon will cost 2 units and Lower Bann will cost 1 unit. 8 What happens if my card is damaged during the Lock passage? Users should present with a valid smart card that has sufficient credit to cover the Lock passage toll. In a situation where a card falls into the water or is accidently damaged in some way through the charging process, a replacement card will be issued by the Lock-Keeper with the corresponding credit balance to the original card set on it. The original faulty card where possible will be retained by the Lock-keeper for background reporting. Note, pre-existing faulty cards will not be accepted. Smart Cards do not have an expiry date and can be kept for future journeys and services, however customers are advised to store their cards carefully to avoid any future card function problems. 9 Can I still pay with cash? All locks will accept cash as well as smart cards until the 30th June 2018. From 1st June until 30th September the lock-keepers will continue to sell smart cards. From 1st October lock-passages can only be paid using the smart card pre-purchased before arrival at the lock. From this date cash will not be accepted at the locks. 10 What services are currently available on the Waterways Ireland Smart Card? Smart cards can currently be used for toilets, showers, pumpout and chemical toilet disposal, laundry, electricity and lock passage on the Shannon-Erne Waterway. 11 Why is Waterways Ireland doing this? There are three reasons. 1) Waterways Ireland want to improve the services for all users of the Shannon, Shannon Erne and Bann navigations. 2) Waterways Ireland must comply with government policy on payments which is moving away from cash. 3) Waterways Ireland already accepts smart card payments for lock passages on the Shannon-Erne Waterway.